The northeaster that battered the Vineyard this week was like a hurricane, only worse. This time the wind lasted a lot longer than four hours. It lasted days. The Island received a hint of the coming severity on Tuesday. The South Shore had breached in several places. At high tide that day, parts of Beach Road in Vineyard Haven flooded. Seaweed and water filled boats tied to the town dock at Owen Park. Wednesday started off blustery. Conditions deteriorated as the day progressed. Early afternoon — about four hours before high tide — the Dock street parking lot in Edgartown filled with water. The Lift van crept through two feet of water in its effort to deliver seniors in the Social Day program to their homes. Beach Road between Edgartown and Oak Bluffs was closed, forcing motorists to take the Edgartown-Vineyard Haven Road. Those driving clutched their steering wheels, fighting against the shoving of the wind. South Circuit avenue in Oak Bluffs became part of Farm Pond; so did low areas of Canonicus. Across the pond, onlookers watched the raging sea crash on the shore and spill water over the road and into the pond. The brownish sea rolled in distinct swelling waves until it hit the rubble lining the Oak Bluffs shore. Then it boiled over, showering everything nearby. 011ie Olivera at Jim’s Package Store on Circuit avenue extension sent customers over to the boardwalk bounding the harbor. “Cheap entertainment,” he promised patrons. Three hours before high tide, the sea played the boardwalk like a piano, lifting planks in syncopation with the tidal surge. New York avenue was awash as the sea reached to Sunset Lake. A woman tried to walk across the avenue to BenDavid’s — she turned back after walking in water up to her knees. Water surrounded Eastville homes, turning yards into ponds. The highway department blocked off the outer perimeter of East Chop with a barricade, secured by concrete blocks. 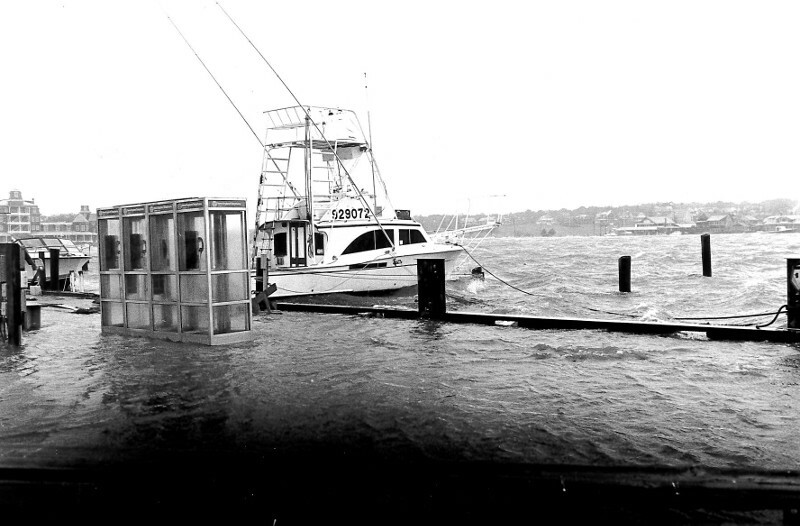 In Vineyard Haven, two hours before high tide, the water had reached Hurricane Bob levels. The early damage was the talk of the officers in the police station. Oil had spilled into the harbor and a good-sized sailboat was beached. “Twice in one year is too much,” said Staff Sgt. Justin Welch, shaking his head. Environmental police officer William Searle was in the station talking about the oil spill, a 50 to 75-gallon leak from fuel lines in one of Ralph Packer’s docks. Officer Searle left his four-wheel-drive running outside — he was afraid to turn off the ignition be­cause of the salty water he had pushed it through to reach Packer’s property. Seaweed hung from the sides of the vehicle. The beached sailboat, Ishmael, was Fred Murphy’s boat. The vessel broke loose from its mooring behind the breakwater and sailed across the harbor to a sandy landing by the Packer fish dock. The mariners paraded to Owen Park to watch as the sea and wind made their boats dance. Phil Hale of Martha’s Vineyard Shipyard stood near the edge of the parking lot, looking grave. Shipyard employees had worked from 7:30 a.m. on Monday until 1 p.m. Wednesday trying to se­cure vessels to withstand the storm. They quit when the weather worsened to forbid any further preparations. Gino Montesi of Vineyard Haven Marina was also at the park with a videocamera in tow. “Two storms, this one and that one,” Mr. Montesi said. “Just when I take over.” Mr. Montesi became proprietor of the marina this summer. The storm was wrecking his marina dock and sending water into the shop. “It’s a shame,” Mr. Montesi sighed as he looked across the harbor. Up-Island the Menemsha fishing fleet was in, waiting out the storm. High tide had come in the early afternoon, making the harbor a wild place as the ocean crashed over the rocks and into the haven. The parking lot was empty as evening fell. Sand flew across the lot, stinging anyone it contacted and extending the beach. Inside the station a few folks gathered to look out the windows and worry. They talked about the breaches of Squibnocket and Chilmark ponds and wondered if the boats in the harbor would hold undamaged. A man fought his way in, opening the door against the wind. Inland the wind forced down branches and leaves. Small debris cluttered North Road. A tree fell across the Edgartown-Vineyard Haven Road blocking one lane. By Thursday morning the wind died down and Islanders emerged to tend the damage. The Vineyard Haven town dock in Owen Park sagged in places. Planks were gone. Still mariners were using it as they made their way to the boats now gently rocking in the harbor. A Watercourse Construction bulldozer was helping to dig out three sailboats beached between 0wen Park and the Steamship Authority terminal. Nyatonga, Procyon and Sheer Water clumped together on shore, beaten and scratched. Down by Coastwise Packet Co., Capt. Robert Douglas and his employees stood on the seaweed covered dock. The sailboat Mer­lin was perched askew on the railway next to the dock. Ayuthia stood erect in the sand by the Steamship Authority staging area. Jeisook Thayer wandered around the boats taking photos. “We were lucky,” she said. The Thayers got their boat out of Lake Tashmoo before the storm became really fierce. Beach Road was abuzz with activity. The fire department hooked up hoses and pumped water down a storm drain from the submerged Hinkley’s Hardware property. Water continued to fill low-lying East Chop lawns. Docks stood skewed and broken. The sign designating Telegraph Hill hinged downward. By 10:30 a.m. traces of the sunken boat Joanne and Michael were gone. But the smell of fuel lingered in the air. Farm Pond remained exceptionally high. Beach Road showed scars from gushing water, the asphalt crinkled in places of greatest velocity. Just before the Little Bridge the road was barricaded to cars. Grant Bros, Inc., crews were out shoving sand aside in an attempt to clear the way between Oak Bluffs and Edgartown. The storm left a beach in the Little Bridge channel connecting Sengekonacket Pond and the sea. It deposited a thick layer of State Bead sand on the freshly paved road and bike path. Midway between the towns the sea had claimed the road up to the center line. By midday yesterday the water had retreated from the banks of Eel Pond. The Edgartown lighthouse once again was surrounded by land - Wednesday night it stood in water. About a dozen scallopers combed through the thick carpet of seaweed around the lighthouse, filling their buckets with bounty left by the storm.